Olympus OM-2, employed electronic shutter in reverse of the OM-1 with mechanical shutter, was yet developed and designed almost at the same time with the OM-1. And therefore its appearance, compact "OM-Size" body that had built up on the OM-1 and most of the parts used, both inside and outside, are very much the same with one exception - the exposure compensation dial. One of the noteworthy and also legendary feature of the OM-2 was that TTL direct metering was incorporated in the camera for the first time in the world. Until then, exposure meter built in electronic-shutter AE cameras could not read light while shutter was running. So it read light before shutter was released, and shutter speed, or aperture was calculated out of that light data. But with TTL direct metering, light was read just as the light reached the surface of the film through built-in exposure meter. 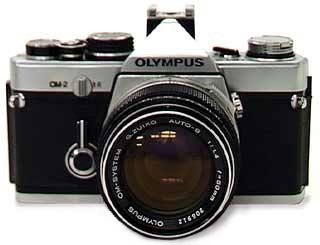 In 1979 which was four years after the first OM-2, an upgrade version named OM-2N was introduced. This model featured interchangeable viewfinder system, full information in the viewfinder and up to 120 sec. of Time Exposure which used to be 60 sec. on the OM-2. And in 1984, the last model in the series named OM-2 SP came on the market. On this model was added Programmed AE mode and Manual Exposure mode with spot metering. First introduced in November, 1975. Body weight (with f1.4/50mm lens) : 750 g.